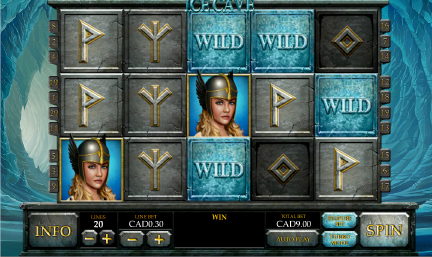 ICE CAVE slot can be played at Fly Casino! This new game will give you the chills when hitting big winning combinations. This new addition to Fly Casino is a 5-reel, 20-line game that features wonderful graphics and flawless game play. Like many slots at Fly, this new game is offer some really great features to enjoy. Rather than spinning bonus feature to appear, Ice Cave provides you with a bonus feature that appears so often that it’s almost a part of the regular game play. The Wilds are main attraction of Ice Cave – there are two symbols you want to look for: Ice Wilds and Hammer Wilds. Ice Wilds will only appear on reels three & four and substitute for all other symbols you are issued a 3X multiplier in winning combinations. However, the really awesome part is that Ice Wilds remain frozen in position until a Hammer Wild hits. For an extra wager per spin, you can add Ice Wilds to reel five during your game play. Hammer Wilds substitute for all other symbols and top up winnings with a 3X multiplier. Hammer Wilds appear on reel two only and thaw out any frozen wilds. Try it today – it’s a blast! $150.00 Super Value Sunday! On Sunday from 00:00GMT until 23:59 GMT, all members will receive a 150% bonus up to 150.00 on your deposits of JUST $/£/€10 or more. Ice Cave – 30 Free Spins Monday. From 00:00GMT until 23:59 GMT, all members on their deposit of just $/£/€10 or more will receive a 75% bonus up to 75.00, plus 30 free spins to enjoy Ice Cave. 110% Big Money Tuesday! From 00:00GMT until 23:59 GMT, all members are invited to receive a 110% bonus up to $/£/€220.00 on your deposit of just $/£/€10 or more or more.